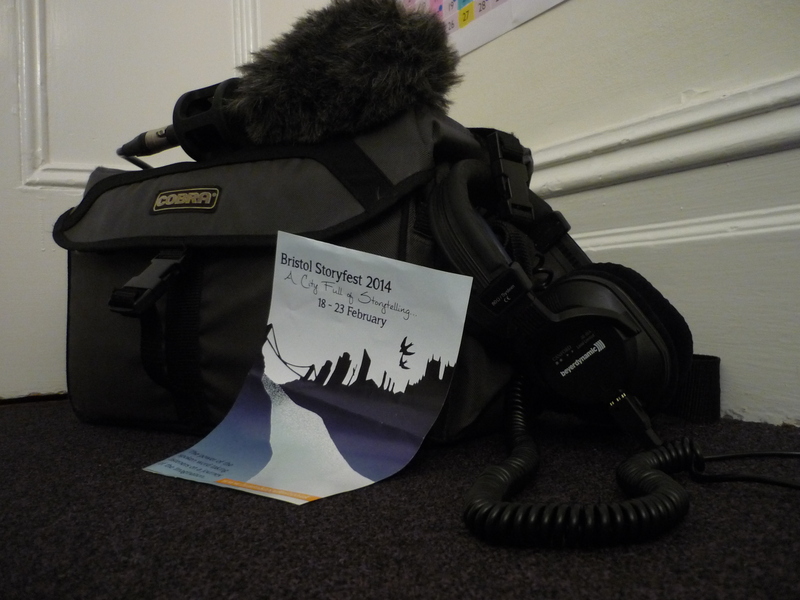 What better place to start a mission to record the spoken word, than at a Storytelling Festival! Bristol Storyfest to be precise. Six glorious days of tales and tellers – old and new, traditional, cutting edge and avant-garde. There were myths and legends and fairy-tales galore, gruesome ghost stories, word-games and improv, folk-songs and experiments and at least one poem about a hedgehog. Phew! I grabbed my trusty recording equipment and pointed my microphone at anything and everything which didn’t actively swat me away. And I’ve had a blast. Truly, if this is representative of some of the storytelling talent we have lolling around this city, I don’t think this podcast is going to be at all hard to put together! Now it’s time to sit down with a big bowl of snacks, massive pair of headphones, and start listening back to it all. That’s me in the corner, with the *Do Not Disturb* sign around the neck. This entry was posted in Posts and tagged Bristol, storyfest, storyteller, storytelling. Bookmark the permalink.